After endlessly insisting that I didn’t come from a very food-centered family, it’s time for me to come clean. The truth is that there are corners of the culinary universe that certain members of my family dominate with awe-inspiring mastery and skill; corners containing things that I would pay a king’s ransom to be able to do myself. Take my dad, for instance. It’s no secret that he has an inordinate fondness for fresh produce of all shapes and sizes; beyond that basic preference, though, you could be forgiven for thinking he’s not particularly picky about what gets tossed into his shopping cart or how it ends up on his plate. As long as it’s fresh and healthy, he seems to be happy, and he’s certainly more than willing to defer to me in all matters culinary whenever I’m around – whether that be in the supermarket or in the kitchen. Nevertheless, there is one thing that he always insists on procuring himself. This is a food he loves so dearly that in order to only buy it at its peak he’s spent a lifetime training himself to decipher its mottled signals and understand its complex clues. There’s no hasty once-over in the supermarket where this food is concerned, but instead a long, time-honored selection ritual that takes a good part of an afternoon and draws stares of curiosity from other customers. And despite the fact that I’ve been witnessing this ritual for 27 years, it’s an act in which I have never even dreamed of interfering, such is the complexity and sophistication of the technique. This food, my friends, is the watermelon, and when it comes to picking out a watermelon, my dad has a trick or two up his sleeve. After years of patiently watching this display, it was inevitable that at some point my culinary braggadocio would surface. One day this summer we were standing in the supermarket; I was watching idly as he tapped and listened, tapped and listened, when suddenly arrogance and impatience won out and I spoke up. "Don’t you know about the netting criteria?" I asked, trying to sound casual. "Oh, see I recently read in one of my cookbooks that you can actually tell the sweetness of a watermelon by the amount of brown netting it has visible on the skin. It has something to do with the sugar content." I pointed to a melon he had just discarded which had a large amount of serpentine netting near the stem end. "Like this, see? It’s that simple. This one should be perfect." He examined the melon I had pointed to, running his fingers over the brown marks. My pulse quickened – maybe I had just imparted the piece of crucial information that would seal the coffin forever on the interminable tap-and-listen. He looked thoughtful for a minute, and then spoke. "But that only tells you about the sweetness, right?" "And what about the juiciness, and the crispness of the flesh? What if it has a texture like wet cotton? Sweetness isn’t everything, watermelons are very complex." "Oh, well, I didn’t think of that, " I said, my voice trailing off, instantly sorry I had opened my mouth. He smiled wistfully. "I think I’ll stick to my way." And he went back to tapping. I don’t know if it’s the feel of the flesh of a just-ripe watermelon under his thumb, or the particular sound it makes when he thumps it, or the melon’s weight, balance or smell, but somehow he’s figured out that secret language watermelons use to tell us they’re perfect. I know it sounds crazy, but it’s true that in all my years of melon shopping with him he’s never brought home a dud. And usually the ones he picks out are so good, there’s nothing better than to eat them plain, ice-cold from the fridge in big, thick wedges. In fact, I was well into adulthood before the thought even crossed my mind that there was anything else one could do with a ripe watermelon besides just scarfing it down like that. Fortunately, though, I’ve discovered a couple of new uses for watermelons that are just as delicious even when I bring home the inevitable less-than-stellar specimen, as without the benefit of his help I often do. I used to assume that one day he would get around to indoctrinating me into the ways of his secret melon methodology. But after seeing that mischievous glint in his eye that afternoon as he dismissed my prized new technique, I’m now quite sure he secretly enjoys having me one-up when it comes to food, even if that only extends to picking out watermelons. Watermelon and feta may sound like a strange combination to you, but it’s eaten this way all over the Eastern Mediterranean – the salty-sweet combination works really well. Combined with the crunchy pine nuts and fragrant basil, this has become one of my favorite ways to enjoy this beautiful melon, and it’s reliably delicious whether I’ve managed to pick a perfect one or not. 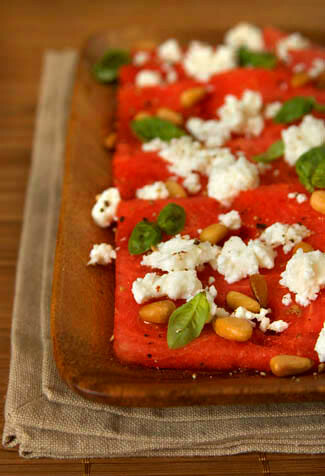 Combine the watermelon, feta, pine nuts and basil leaves in a large bowl or platter. Drizzle with some extra-virgin olive oil and sprinkle with pepper. Eat immediately. Great story, Melissa. When he shares his technique, I hope you will pass it along! Wow! That is one of the most gorgeous and interesting displays of food I’ve ever seen. I can’t believe that is a bed of watermelon! Yum! Great story–and here I thought those were tomatoes! What a stunning and summery dish (photograph)! Hi Melissa,What a great story. I’ve been eating watermelons forever and still don’t have a tried and true technique for picking one out — I still get duds every now and again. The salad sounds tasty, something that I should try one of these days! Dear MelissaThe ability to pick out great produce is such a rare, almost mystical, yet often underrated talent isn’t it? I really enjoyed reading this post, and gazing at your artfully styled and photographed dish. Hi Nic – Absolutely, if he ever deems me worthy!Hi Brett – You never realize how much you need a good produce seller until they’re gone – it’s amazing how much difference it makes! I’ll make sure to ask my dad if he’s considered a new career in melon purveying… ;)Hi Beth – It’s a really surprisingly good combination – give it a try if you can get your hands on some good melon!Hi Jeanne – Thanks! You know, the tomatoes I’ve been bringing home haven’t even been this red…Hi J – Oh, I love a good crab too. Funny how men seem to have these mystical abilities – if we got our fathers together we could have quite a feast!Hi Gemma – Thanks! I hope your odyssey is off to a good start!Hi Reid – I know exactly what you mean. I was really excited to learn about the netting thing, and barring any better technique it’s the one I’ve started using myself. Nevertheless, it’s far from foolproof…Hi S – Thanks, and well said. Some people seem to have been born with a gift, but for the rest of us it’s sure a lot of trial and error…Hi Paz – Prayer, very funny! Sniffing is definitely a good method for a lot of fruits, but I think probably the best technique is probably to buy as close to the source as possible – it never ceases to amaze me how much better everything tastes straight from the hands of the people who grew it! What a great talent and what a great story. It for some strange reason reminds me of those talented squirrels in Charlie and the Chocolate Factory. Your salad also looks delicious. What a wonderful warm weather treat. Melissa, the salad looks gorgeous! the colours are stunning, and the presentation is perfect! Ive heard of the combination of watermelon and feta before, particularly with black olives added in. Its always peaked my curiosity, but I’ve never tried it. Your combination seems quite lovely though, and worthy of giving it a try. I am terrible at picking out watermelons, and usually go for the ones that are already quartered. Even then, I still somehow manage to find the duds. hi melissa, im very new to your blog … kinda chanced upon it … and im totally mesmerized! ur blog rocks!!! hehe… i mean its really gorgoeous looking …all the food looks yummy! and the stories are so captivating! Very very well done!and this watermelon salad looks so good and so easy! will definitely try it soon! I loved your description of your dad communing with the watermelon. I could just picture it! Alas it’s a valuable skill I am yet to acquire =(Wonderfully written post as always and great picture. I keep meaning to try watermelon with fetta. It sounds strange but good. Melissa – I just posted a very similar recipe as one of my new favourite warm-weather salads…we must have been sharing a brain because I hadn’t yet read yours when I wrote mine! Weird…and here I thought most people had never heard of the odd but delicious combination of watermelon and feta. YUM. very nice.i also like watermelon and feta cubes on a rosemary sprig skewer. altho’ it can be tricky to get them perfect cubes. Hi Jennifer – That’s funny, it must be a last desperate attempt to hold on to summer! Yours looks great too, and I’m glad to hear I’m not the only one familiar with this fantastic combo.Hi Faustianbargain – That’s a very interesting idea with the rosemary. If I ever make this for a party I’ll keep that in mind!